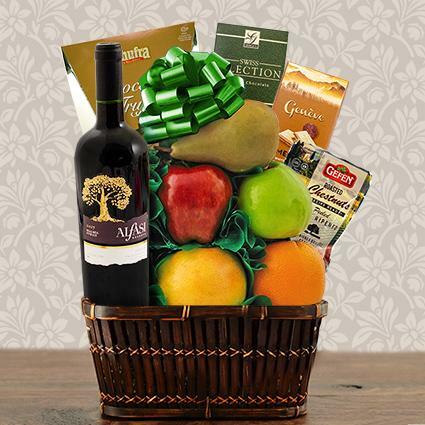 Make it a sweet Passover with Malbec Syrah red wine, Swiss chocolate, truffles and other holiday goodies, alongside five pieces of farm fresh fruit! Fresh fruit can be shipped all year round via Ground delivery if it is expected to take less than three calendar days to arrive. Deliveries going further than a 3-day zone must go Express delivery. We cannot ship fruit baskets to California. Alfasi Reserva Malbec Syrah, from the vineyards of Chile, is a well-structured red blend with notes of rich plum and raisin intermingled with hints of vanilla and coffee. Is a delightful accompaniment to hearty beef, veal and poultry dishes, as well as pasta and cheese. 1 to 5 business days*, depending on location. Delivery times are estimated. To calculate the approximate Ground delivery transit times, click on the color-coded delivery map. Anything going to Alaska and Hawaii must be shipped Express, either 2-day or Overnight. For any additional shipping info, please click on Shipping. *Fresh fruit can be shipped all year round via Ground delivery if it is expected to take less than three calendar days to arrive. Deliveries going further than a 3-day zone must go Express delivery.